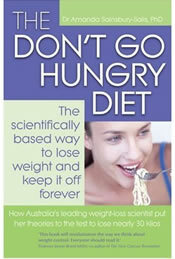 The Don’t Go Hungry Diet is the creation of Australian molecular scientist and weight loss researcher Dr.Amanda Sainsbury-Salis. Like many young women Dr. Amanda began dieting in her teens even though she was at a normal weight. After many years of struggling with yo-yo dieting she realized that she had ‘dieted herself fat’. She entered into a career in medical research so that she could find an answer to her own difficulties in managing her weight and set out to discover the reason why diets don’t work as a long term solution to weight loss. Dr. Amanda explains that the key to successful dieting is to understand and work with the body rather than trying to fight it. She goes on to describe how dieting triggers chemical and hormonal changes in the body, labeled as the ‘Famine Reaction’, which make it extremely difficult to continue to burn fat. Dr. Amanda tells us that by eating mostly nutritious foods in amounts to satisfy our hunger we can turn off the ‘Famine Reaction’ and reset our metabolism so that we can continue to lose weight. She also explains that eating this way won’t lead to excessive weight gain because our bodies also have another mechanism which she calls the ‘Fat Brake’ that makes it really hard to get fat so long as we learn how to tune into the messages it sends us about eating. Dr. Amanda does not offer a precisely structured diet plan but instead encourages dieters to rediscover the awareness of the body’s requirements for nourishment. There may be short period of lower calorie eating but whenever the ‘Famine Reaction’ sets in, which can be indicated by an increase of hunger or cravings for rich foods, dieters are advised to eat to their satisfaction whichever foods they desire but without overeating. She tells dieters that it may take some time to find balance but by continuing to supply the body with nutritious fuel it will respond by sending us clear messages about what foods are necessary and in what amounts in order to produce optimal health and weight control. Although there are no foods that are off limits Dr. Amanda does advise making healthy choices as much as possible and to always include fruit or vegetables in each meal. She also recommends choosing low glycemic index foods such as whole grains, nuts and legumes so as to assist with our ability to eat to satisfaction while regulating appetite and boosting long term energy levels. Dr. Amanda also states that eating a wide variety of foods with different flavors is important as this will help reduce cravings for sweets. Although dieters are encouraged to eat in accordance with their own instincts and desires Dr. Amanda does offer some guidelines for creating meal plans. A sample menu may be similar to the one outlined below and is based on low glycemic index foods. Other healthy meal ideas can be found here. Dr. Amanda advises to become as active as possible and especially recommends walking as a good form of exercise. She says that medical research proves that in order to lose weight and maintain the loss we need 8 to 12 thousand steps per day. These exercises can also be used with the Dr. Amanda Diet. The Dr. Amanda’s Don’t go Hungry Diet retails for $22.95, however, Dr.Amanda also offers personal consultations and online coaching programs which are $395 Australian dollars for a 3 month program. Personal Journals and Pedometers are also available to purchase from Dr. Amanda’s website. No calorie counting or weighing. May help chronic yo-yo dieters and binge eaters break out of this cycle. May not appeal to dieters who like the security of a specific plan and calorie counting. Relatively new and lacking in online support. Dr. Amanda provides a very refreshing new approach to dieting and weight loss that is supported by the latest in scientific research. Although her diet is based on scientific theories she presents her ideas in a way that is easy to understand and offers real solutions for those that have been struggling with conventional weight loss diets without being able to achieve their goals. Brianna:I just have to comment on that questions of yours. 110??14? ?What weight do you have to get rid of? You seem to be really light,don’t take it so hard. At least try to go on a healthy diet. But I don’t think you should go on a diet though. Amazing I love the diet…It saved my life also. It brought me out of a dark hole! Thank you so Much. !!!!!!!! I LOVE THIS DIET!!!!!!!!!!!!!!!!!!!!!!!!!!!!!!!!!!! i wrote down all the utilities i need and i am going to try this diet.. I think i am fat i am 11 and i weigh 68 pound tell me if you think i am fat cause i sure do..
Dr Amanda comments on Oprah’s latest bulge. For Brianna: No, Dr Amanda recommends her diet over 18s. Im 14..i wiegh 110..And im a cheerleader..And i fly..
and im worried that if i dont lose some wieght i might not go up in any stunts next year..Would you recomend this diet for me? Before having children I was slim and could eat whatever I liked. For the past 12 years I have been steadily gaining weight and for the past two years I was getting quite concerned, not only because of my weight but because of my growing appetite and pesky cravings especially in the evenings. I read Dr. Amanda’s book. Put her recommendations in place and have not have those silly cravings since. I also noticed, listening to my hunger cues and satiety cues, I ended up eating almost half the portions of what I normally would eat out of sheer habit. No hunger, no limitations, no cravings….it is so liberating! Do yourself a favour and check her book out. Been doing this for a little under a month now and lost 5 kg. and 5cm. off my waist and hips. I notice that the loss is slowing down now, but I don’t care. This way of “dieting” is not a chore I’ll do this forever. I am back to the way I handled food intake when I was younger and now understand why I could eat anything in those days without gaining weight. It is just that I ate according to my hunger/satiety levels and my body regulated my weight for me. This is precisely what Dr.Amanda’s approach will help you to do. Go for it! This diet saved my life. The book is a must read. Such a page turner. Sometimes you think you are reading a detective book instad of a diet book.